Here’s a dose of history to go with the drama Victoria – Masterpiece. 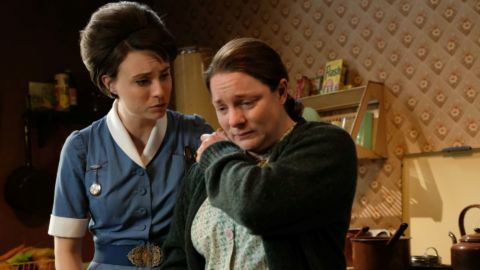 We share some of the true back-stories to the historic figures and cultural references in the hit British series – down to the desserts. The series, airing Sundays at 9 p.m. on THIRTEEN, is followed every Sunday night by our British Telly Dish Victoria episode recaps. Affectionately nicknamed “Pam” by the British public, this British statesman had a long career in the United Kingdom. His social set dubbed him dubbed Lord Cupid for his multitude of mistresses – some notorious in their own rights – including all the hostesses at Almack’s social club, later to be known as Boodles (which Downton Abbey fans would recognize). Lord Palmerston (1774-1865) began his political career as a Tory MP in Parliament and then switched to the Whig party, and finally the Liberal party. He enters Victoria Season 3 as foreign secretary – a position he held from 1830 to 1834, 1835 to 1841, and 1846 to 1851. Victoria shaves at least 10 years of off Pam’s life for best dramatic effect. In 1839 he married Lord Melbourne’s sister Emily, which required the approval of Queen Victoria. Both in their 50’s at the time, Emily had been Palmerston’s mistress for years and one of her daughters, by her first (late) husband, was said to have been fathered by Palmerston. They lived at Brockett Hall. Expedience was Pam’s only guiding principle. He sympathized with some aims of the 1848 revolutionaries in Europe. 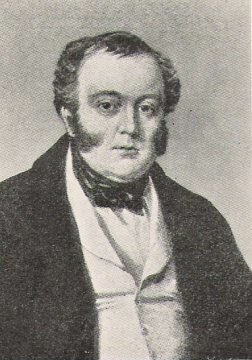 His regular failure to keep Queen Victoria and cabinet members well informed caused embarrassment, but because of his public popularity, Prime Minister Russell feared dismissing him. When Palmerston approved Napoleon Bonaparte’s coup d’etat, Prince Albert’s disapproval led to his resignation in 1851. It only took until 1852 for Palmerston to begin a three-year term as home secretary and then came his two terms as Prime Minister. While in that office he was instrumental the creation of divorce court (rather handy), allowing people to get divorced without a private act of Parliament. The statesman, played by Laurence Fox (Inspector Lewis) makes his grand entrance in Victoria Season 3. Learn more about him in our Season 3, Episode 1 recap. Victoria and her older half-sister Feodora had the same mother, the German Princess Victoria of Saxe-Coburg-Saalfeld. After she was widowed, she married Victoria’s father, the Duke of Kent. When the baby race for the British throne began, the whole family moved from Germany to England for Victoria’s birth. Feodora grew up in Kensington Palace alongside Victoria, and reportedly hated it almost as much as her younger sister did. She married a German prince she’d only met twice, moved to Leiningen and never looked back – though she did maintain a lifelong correspondence with Victoria, who was fond of her (unlike what we see depicted in the Victoria series). Learn more about Feodora (played by Kate Fleetwood) in our Season 3, Episode 1 recap. 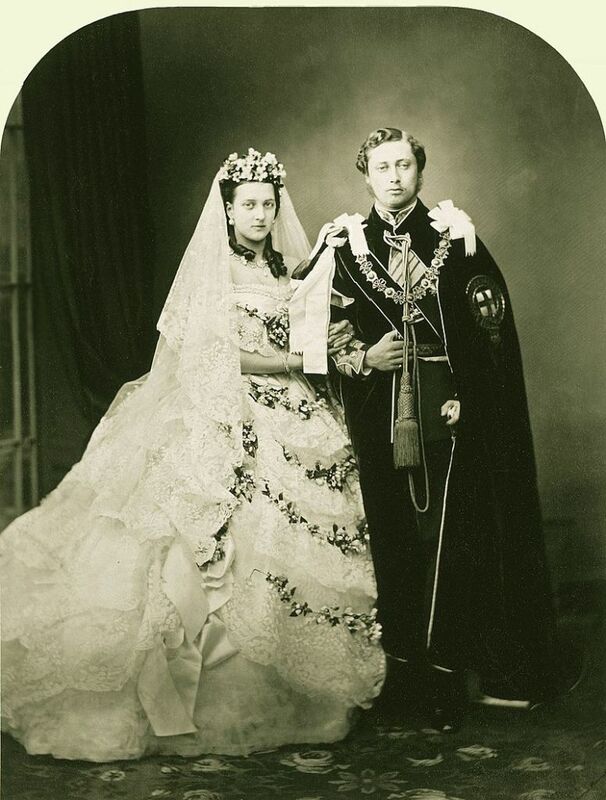 Wedding portrait of Alexandra of Denmark and the Prince of Wales (later King Edward VII), London, 1863. Does he not bear a resemblance to the Duke of Monmouth in “Victoria”? Bertie’s rebellious streak that we see in Victoria Season 3 never ended. Like Prince Albert’s father and brother, Bertie was a prolific womanizer. Among his many mistresses were Winston Churchhill’s Brooklyn-born mother Lady (Jennie) Randolph Churchill and Alice Keppel, the great-grandmother of Camilla Parker Bowles. (It has been widely reported that Camilla used that factoid as an opening gambit when she was first introduced to Prince Charles). People joked that the reason Victoria lived as long as she did (she died age 81) was her ambivalence about Bertie becoming the sovereign. Even as an adult Bertie, the Prince of Wales, did not read, but he was thought to be a brilliant king and popular. In many ways, he was a reformer ahead of his times. 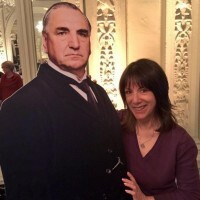 He thought racial epithets, common in the day, were “disgraceful.” One of the things that drew criticism in his life was the fact that, in a time of rampant anti-Semitism, he socialized with Jews. His reign was much shorter than his mother’s; he was an avid smoker and died at the age of 68, after a series of heart attacks. The Duke and Duchess of Monmouth (Sophie) in Episode 4 of Victoria, Season 3. 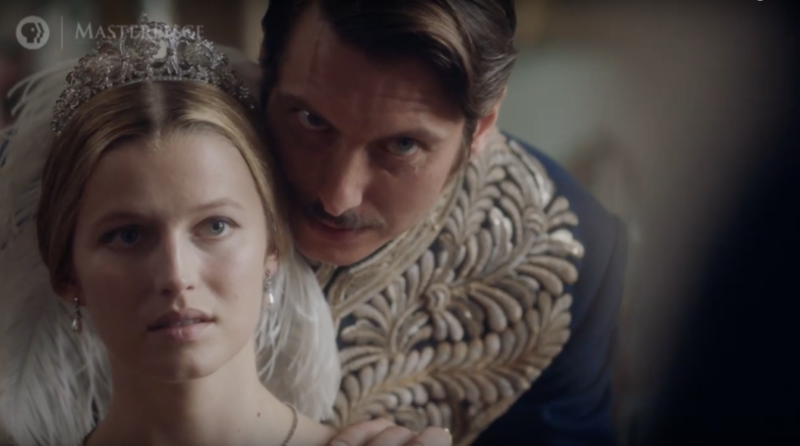 Don’t fret too much about the unhappily married couple in Victoria Season 3: there were no Duke and Duchess of Monmouth titles during Queen Victoria’s reign, so they are entirely a fiction. The first Duke of Monmouth, who was the illegitimate son of King Charles II, lost the title, along with his head, in 1685 after leading a rebellion to depose King James II in an effort to become king himself. His Duke of Monmouth title was forfeited, though his other titles (which included Duke of Buccleuch) eventually passed to his grandson. The character Sophie – the Duchess of Monmouth – is the daughter of a wealthy grocer. In truth, all of Victoria’s Mistress of the Robes were aristocrats. The Mistress of the Robes during the time period in Victoria was Harriet, the Duchess of Sutherland who, when last we saw her in the series, was contemplating her future with Prince Ernie. As for the scandalous grandmother that the Duke suggested Sophie dress as in the Episode 6 christening ball, might the inspiration have been the colorful and tragic Duchess of Devonshire? The clues: she married a Cavendish (as Footman Joseph mentioned), the family seat was Chatsworth, and she was painted by Thomas Gainsborough. The Duchess of Devonshire was Harriet’s grandmother (see the Season 1, Episode 5 recap). She was also a Spencer, and the great, great, great, great aunt of Princess Diana. The Gainsborough portrait of the Duchess, that Monmouth shows off in Episode 6, has a history almost as colorful as the Duchess herself! 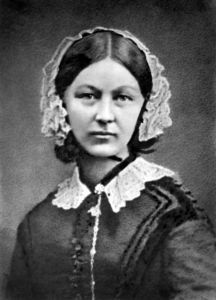 Florence Nightingale (1820 – 1910) is considered to be the founder and icon of modern nursing and is a well known icon of the Victorian age itself. She came from an upperclass family who initially opposed her choice of profession, but she persisted. She became famous during the Crimean War (1853 – 1856). She observed that more soldiers died from infections than injuries and created hygiene protocols that saved lives. She became known as The Lady With the Lamp after The Times of London wrote a story that described her nighttime rounds to soldiers by candlelight. Nurses serving in the American Civil War knew of her work and followed her practices. Like most people of her day, where cholera was concerned, Nightingale believed the miasma theory – that it was caused by contaminants in the air (even long after it was proven otherwise). To this day, nurses take the Nightingale Pledge, a version of the Hippocratic Oath, and the most distinguished award in nursing is called the Florence Nightingale Medal. George Hudson, railroad financier and politician. George Hudson and his wife are seen dancing merrily at the christening ball in Episode 6. They bought their invitations from Feodora and Queen Victoria is much displeased. Hudson (1800-1871) was a railway financier known as the railway king when he and his partner controlled more than a quarter of the U.K.’s rail lines. For a time he was the richest man in England, and he became a Member of Parliament via bribery. His bubble burst. He was suspected (like some others at the time) of stock manipulation and other fraudulent financial activities. In his pyramid scheme, he paid shareholder dividends out of shareholder funds rather than profits. His railway businesses went belly up and Hudson sold most of his assets. It was only the fact that he was an MP that prevented him from being prosecuted for debt. After losing that Parliament seat he lived abroad for years to escape his creditors (and prosecution). When he returned to stand for election, his rivals had him arrested for fraud and he served three months in prison. Queen Victoria met George Hudson when she and Albert took a train to the Cambridge University commencement in 1847 and Hudson attended them. There is an engraving of their meeting. At this same commencement, Prince Albert (yes, he really was the university chancellor) gave an honorary degree to Lord M.
Marron glace, Queen Victoria’s favorite treat (or maybe just her favorite pregnancy craving) is mentioned in every Victoria season. I had never heard of them before and considering that there’s sugar involved, it’s actually quite shocking it’s taken me this long to investigate. They are candied chestnuts. The confection originated in Italy and France and is made by poaching chestnuts in sugar syrup and vanilla for two days before cooling and glazing. If you’re in London you can pick up a box of the pricey little treats at Selfridge’s (£60 for a box of 20 – that’s $76!). 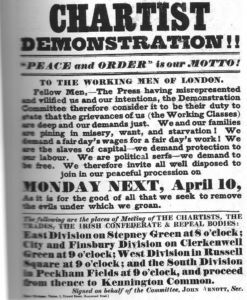 Chartist announcement of April 10, 1848 rally. Working class Chartists get a lot of screen time in the Season 3 premiere of Victoria. Chartism was a movement for political reform in Britain – named after the People’s Charter of 1838 – and active from 1838 to 1857. Support for the movement was at its highest in 1839, 1842, and 1848, when petitions signed by millions of workers were presented to the House of Commons. The main aim was to win suffrage for all men, regardless of property ownership. That right to vote for men wasn’t gained until 1918, after World War I. Even though the movement called for voting rights for men only, it has been estimated that about 20 percent of the signatures on Chartist petitions were from women. Victoria Season 3, Episode 1 includes the mass Chartist meeting that took place on April 10, 1848 on Kennington Common. The rally turned into a procession to present a third petition to Parliament. FYI: William Cuffay was one of the organizers of the April 1848 Chartist Rally. Cuffay was mixed race, born to an English woman and a man of African heritage who was once enslaved in St. Kitts. A tailor by trade, William had previously tried to organize other tailors to demand a ten-hour workday and became blacklisted from employment. As a delegate to the Chartist Council, he became frustrated with the progress of the peaceful protests and led a radical faction that wanted to show more force. But there was a government spy embedded in the movement who gave him away. He was convicted of “preparing for arson” and sent to Tasmania. He was pardoned three years later, but remained in Tasmania where he continued his political organizing activities until his death in 1870. The Crystal Palace in Hyde Park. Image: Dickinson’s Comprehensive Pictures of the Great Exhibition of 1851. 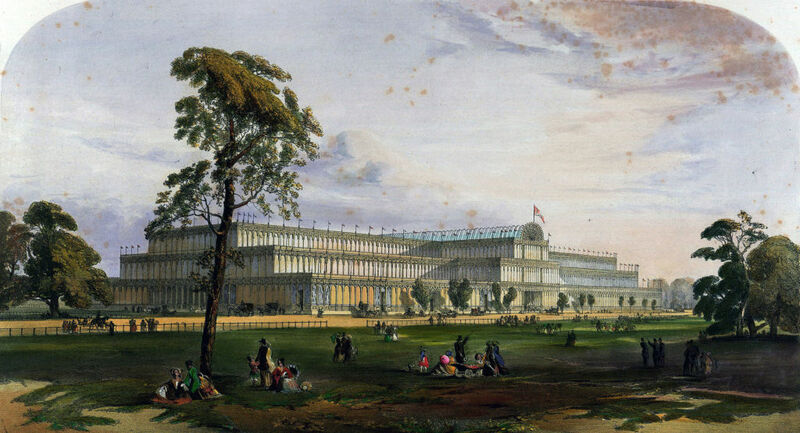 The Great Exhibition (May 1 – October 15, 1851) in London’s Hyde Park was also known as The Crystal Palace Exhibition because of its temporary glass building, designed by Joseph Paxton. The structural marvel was made of cast iron, wood and plate glass, three times the size of St. Paul’s Cathedral and over 1848 feet long (more than five football fields). It was the first World’s Fair, and was organized primarily by Albert and inventor Henry Cole (who later received a knighthood for it). Under Cole’s direction, the profits made from The Great Exhibition were used to found the Victoria and Albert Museum, as well as Natural History and Science Museums. There were over 100,000 objects on display and one of the exhibition’s goals was to achieve world peace through free trade. A boffo success, it was visited by six million people made Prince Albert the father of temporary exhibitions. One of the many items on display was the 105-carat the Koh-i-Noor diamond, one of the largest in the world, which later found it’s way into Queen Elizabeth II’s crown. The Crystal Palace was dissassembled after the exhibition and re-erected in southeast London in 1854. Sadly, it was destroyed by fire in 1936. Winston Churchill, said of it, “This is the end of an age.” There is a Crystal Palace Museum in London, open only on Sundays, dedicated to the history of the groundbreaking building. In Episode 7, this plant’s ribbed leaf inspires a structural solution for the architect who will build the Crystal Palace to hold the Great Exhibition. 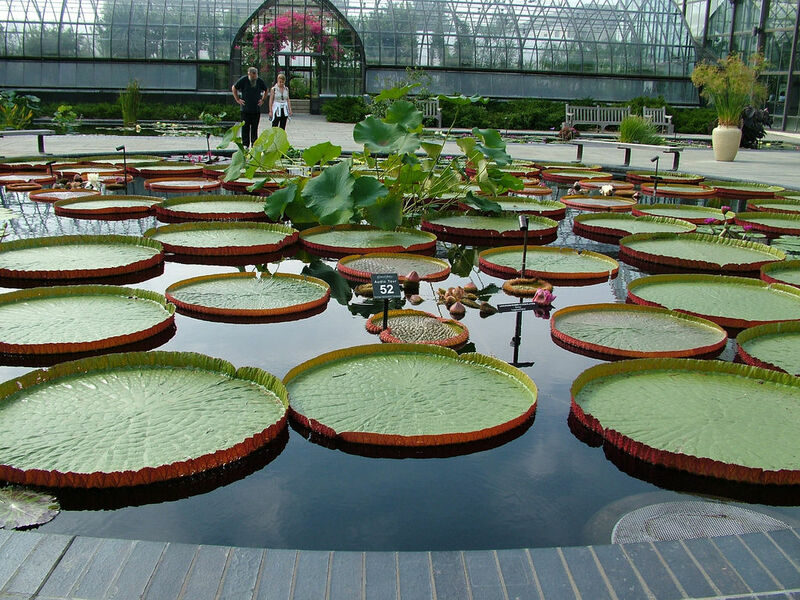 The world’s largest water lily was renamed the Victoria Amazonica Water Lily in 1837, to honor the new Queen. It blooms in July and August and has leaves that can grow to over nine feet in diameter. Even though those leaves are very delicate, because of the ribbed structure on their underside, they can hold up to 71 pounds in weight (if it is evenly distributed). Native to the Amazon River basin, when it was first brought to England, there was a friendly rivalry between avid gardeners to be the first to get one to flower. The winner was the Duke of Devonshire who, in 1849, got one to flower by creating a warm pool using coal-fired burners. He presented a flower to the Queen. Cholera, which has killed tens of millions of people since the 19th century, is a bacterial infection of the small intestine that can cause diarrhea and dehydration so severe that, left untreated, it can cause death within hours. Treatment, however, is a simple oral rehydration solution (sugars and salts) mixed with large amounts of water. There were numerous outbreaks in the U.K. in the 19th century. In one, a woman washed a diaper in well and caused an outbreak that killed over 600 people. 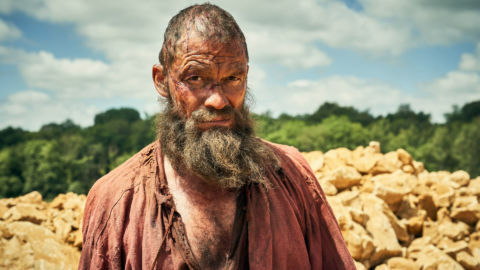 Which begs the question, even when people didn’t yet understand hygiene, why would would anyone drink out of a well that was also used to wash diapers? The last cholera outbreak in the U.S. was in 1911, although there are occasional isolated instances. Cholera is still a major issue in the developing world where access to clean drinking water is limited, and where antibiotic resistant strains have occurred. There are vaccines now that offer some protection. Rehydration solutions are the most effective treatment and antibiotics should be used in only severe cases, according to the CDC. Claremont Country House is an 18th century mansion in Surrey, designed by legendary country house and garden designer Capability Brown (who you know – if you watch any country house documentaries on PBS – really got around!) In the 18th century it was possible to see both Windsor Castle and St. Paul’s Cathedral from Claremont. In 1816, in an act of Parliament, it was purchased as a wedding gift for George IV’s daughter, the ill-fated Princess Charlotte and (then) Prince Leopold. She died at Claremont after giving birth to a stillborn son. While King Leopold owned it until he died, he left when he became the Belgian King. 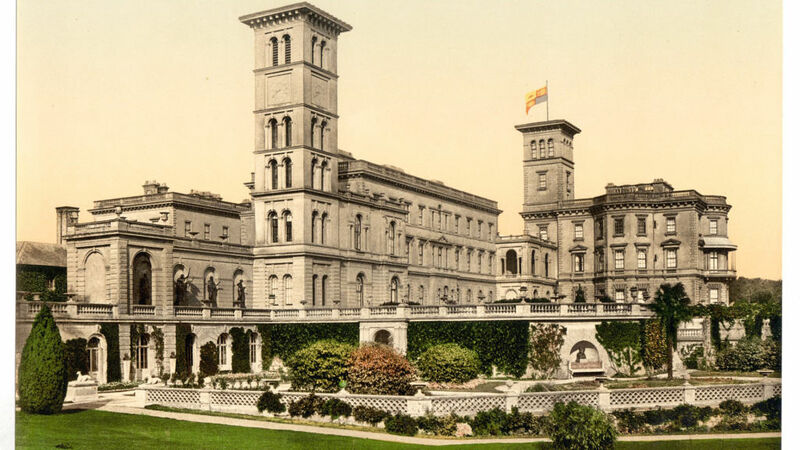 Queen Victoria spent a lot of time there as both a child and an adult, and made it available to King Louis Philippe after the 1848 revolution (see our Victoria Season 3, Episode 2 recap). Victoria eventually bought the house as a wedding gift for her youngest son Prince Leopold, Duke of Albany. It was vacant and slated for demolition when, in 1930, it was purchased and became a school. The grounds were later donated to Britain’s fabulous National Trust, who run it today; it is one of the earliest surviving landscaped gardens of its kind. 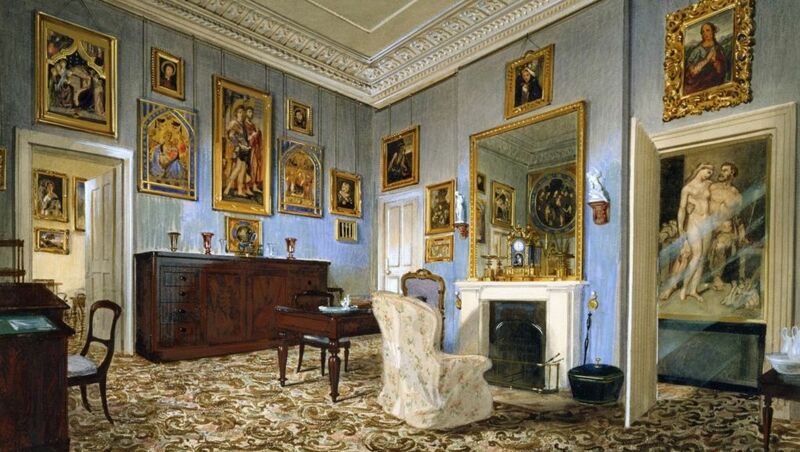 Painting of Prince Albert’s dressing room at Osborne House. At far right is the painting of Hercules and Queen Omphale in his bathroom. A scene of Episode 2 takes place here. Prince Albert designed the royal summer home Osborne House and its gardens on the Isle of Wight (off the southern coast of England). After he died in 1861, Victoria had it preserved to stay just as Albert had created it. In her will she stipulated it stay in the family, but none of the children wanted it, so when she died, Bertie, now the newly crowned King Edward VII, gifted it to the state. Today it is held in private trust, open to the public and run by the same agency that runs Hampton Court Palace and the Tower of London. It is open to the public and features the largest collection of Victoria and Albert’s belongings anywhere, including gifts they gave each other. These two landmarks appear in Episode 2 of Season 3. Originally built to commemorate the Battle of Waterloo, Waterloo bridge opened in 1817. After decades of structural problems, it was demolished and a modern version rebuilt in 1942. The original is immortalized in more than 40 paintings by Impressionist Claude Monet. 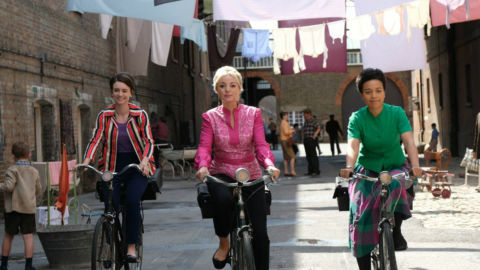 If you are familiar with London, you might recognize the buildings around the bridge in Episode 2’s standoff scene, including the prominent Somerset House on the right. Somerset is a Georgian building on the Thames, built on the site of a Tudor palace belonging to the Duke of Somerset. It passed to the crown when the Duke was beheaded at the Tower of London. It became the home of Princess Elizabeth before she was crowned Elizabeth I. It sustained some bomb damage during World War II but was restored. A thoroughly modern part of the community, it is currently a museum, a center for the arts, has been home to London Fashion Week, and in the winter, sports an outdoor skating rink. Watch Victoria – Masterpiece Season 3 Sundays at 9 p.m. on THIRTEEN, and follow up every Sunday night by chiming in on our British Telly Dish’s Victoria episode recap.